Will Google Do The Right Thing? ISSUE 141: Will Google Do The Right Thing? Serverless Roadmap: Hosted and Installable Platforms. 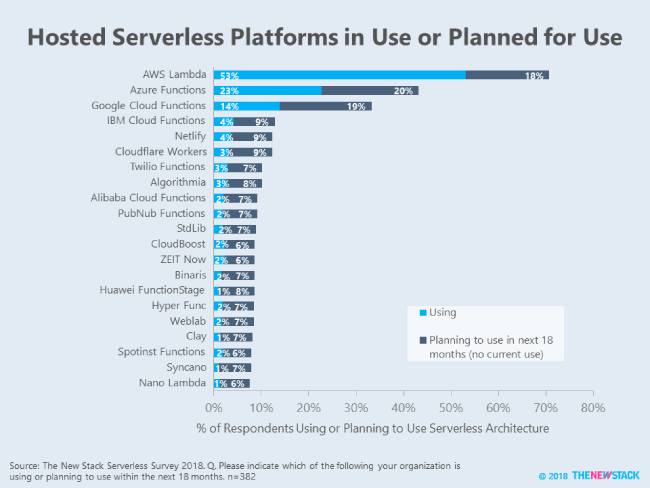 The survey conducted for our “Guide to Serverless Technologies” asked a series of questions about serverless vendors and technologies. We will use those responses in the next 18 months to drive our coverage at The New Stack. Have you ever tried to explain microservices to anyone? Depending on the context, people explain it differently. But when it comes to establishing the relationship between microservices and cloud native computing, no one explains it better than Mark Russinovich, chief technology officer of Microsoft Azure, in this latest edition of The New Stack Makers podcast. The #MeToo movement has come to Google. Will the company listen? Last week, the New York Times ran a shocking report about how Google handled a case of alleged sexual harassment on the part of its then-star designer, Andy Rubin, who led the company’s Android phone development. Upon hearing what it concluded to be credible evidence of Rubin sexually assaulting a fellow employee, Google fired him in 2014, giving him a $90 million exit package, which incensed many people who saw it as Google rewarding Rubin while staying silent on the sexual harassment (Rubin has denied all the allegations). Google had responded to the article, noting that the company had fired over 48 people in the last two years for sexual misconduct, with none of them receiving exit packages. Earlier this week, Axio found that Rich DeVaul, a director at X, the moonshot unit of Alphabet, also was let go because of alleged harassment, though no severance package was given to him. This was not enough to assuage employee fears, however. On Thursday, many Google employees worldwide staged a walk-out to protest — at the time of this writing over 1,000 employees had walked out in the company’s U.S. east coast and European offices alone. They called for an end to forced arbitration in cases of sexual harassment and discrimination, better practices for reporting harassment and misconduct, as well as a commitment to ending inequities in pay and opportunities. Will Google listen? Company CEO Sundar Pichai sent an internal email Tuesday supporting the walk-out, vowing to improve the way Google handles claims of sexual misconduct. Whether the company will do the tougher work of meeting these demands is another issue entirely. The IT world is watching. It’s getting harder to turn around in the technical world today without bumping into some sort of reference to an Application Programming Interface (API). RESTFul APIs bring IT Operations much closer in achieving a declarative, desired end state approach. What does a good developer experience (DX) actually entail? At the Cloud Native conference in London, Daniel Bryant said it’s about filling in the space between when we load ideas into shipping containers and when it all falls over into production. His talks focused on the questions to ask in order to identify patterns and workflows to improve that experience. “Developer experience is primarily about minimizing friction from idea to code to delivering observable business value,” he said. KubeCon + CloudNativeCon is coming to China. Multicloud architectures across distributed platforms has led to a rich community of open source projects. Come learn how these new platforms are serving as the foundation for at-scale application development, deployment and management. 20% off with code KCCNCN18MED20. Register now!